North Light Arts is delighted to present the ‘Alchemy of Soil’, an outstanding exhibition by the Scottish artist Natalie Taylor at Dunbar Town House Museum and Gallery, East Lothian from 23 May – 21 June 2015. Dunbar is probably best known for being the birthplace, in 1838, of John Muir, one of the world’s best-known conservationists, whose chief concern was the protection of our natural environment. This year Natalie Taylor was selected as North Light Arts John Muir Artist in Residence at Dunbar Town House from the 13th to 27th April 2015, funded by East Lothian Council Arts Service as part of the annual John Muir Birthday Celebrations. During her residency Natalie explored the theme of ‘Fertile Ground: Soil’, in particular investigating the importance of East Lothian’s soil. This year the United Nations has proclaimed 2015 International Year of Soils, which offers a unique opportunity to address the crisis in soil sustainability. Dunbar is a in a unique position as local community organisations such as Sustaining Dunbar have been actively exploring sustainability, carbon reduction and composting initiatives and Dunbar was recently named Scotland’s first ‘Zero Waste Town’, piloting a new initiative in Scotland to dramatically reduce waste and encourage the reuse of waste products. Natalie Taylor’s work in the ‘Alchemy of Soil Exhibition’ is a range of previous work and new work made during her John Muir Residency and includes; watercolour paintings, sculpture, drawings, installations and tapestries in dramatically contrasting scales. She has a strong environmental and public art engagement practice and her work is made both in the studio, in site-specific locations and with community groups. Nature penetrates all of Natalie’s work and she is not afraid to look back to history or experiment with different media. ‘Force of Nature’ made in 2012, is a beautiful tapestry after Jacques le Moyne de Morgues ‘Daughter of the Picts’, a 16th-century print of a tattooed girl. The original picture is one of a series of five figures, representing Picts. 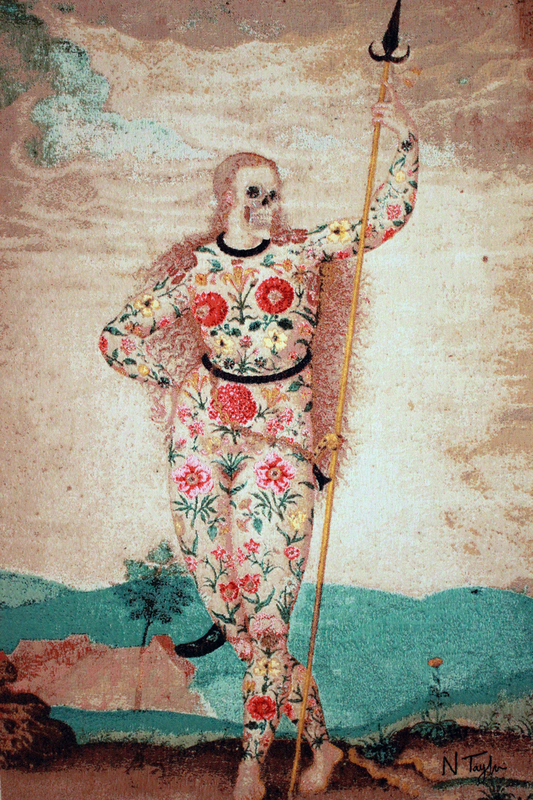 Natalie’s tapestry depicts a naked woman covered in flowers and plants but with a skull for a face. The piece is reminiscent of 15th century Flemish tapestries, which were hand woven over many years. The original by work by Jacques le Moyne de Morgues was exhibited in a travel collection in 1590, the processes that produced both pieces are vastly different: one created from manual engraving and the 16th century printing press, the other a tapestry woven with the aid of 21st century digital tools. There is a dark side to Natalie’s practice, sitting on white porcelain plates in one of the drawers in the display cabinet are a series of small potatoes, which on closer inspection are in fact thumbs. Also in the top section of the display cabinet is ‘Suicide Seed’, a bronze cast of a large emerging seed with skeleton teeth set into it. Both artworks make us question what we find on our plates and if what we eat has a long-term impact on our health. Natalie states “As the John Muir artist in residence in April I was offered two weeks to research the soils of East Lothian. What I quickly discovered was that here in this region we are blessed with healthy fertile soil and the region is still known as the Garden of Scotland. Here we are in a privileged position to be comfortably fed, with easy and cheap access to high quality foods. Of course, we rely on the soil under our feet to provide this. As every farmer and gardener knows: rich fertile soil equals good nutritious crops for market. However, many farmers use chemical phosphorous, potassium and nitrogen to add plant nutrition back into their intensively farmed soil. In the exhibition there is a series of six limited edition giclee prints called ‘Biotech Seeds’, depicting emerging wheat, soya, rice and corn seeds with logos stamped onto them which are particularly worrying. This work makes us think. Are our experiments with nature a step too far and what is the long-term impact of genetically modified crops? “My growing understanding of the soil crisis which, according to the Soil Association means that 30-40% of global soils are under threat of total depletion, had to be translated into a painting, sculpture, or print. After my research period was over I was hit by a sense that the more I looked into the rich biology of the soil, the more I needed to make this visible, so that folk could see what it does for us, and every living creature on Earth. Natalie has shown internationally in exhibitions in Europe, Australia, and Scandinavia. She is currently artist in residence with ‘North Edinburgh Grows’ at North Edinburgh Arts in Muirhouse, Edinburgh where she has worked over the past two years with community groups to develop artworks for a community garden. North Edinburgh Grows was the winner of the creative category in the Scottish Urban Regeneration Forum’s Best Practice in Community Regeneration Awards in 2014, and winner of the Civic Trust Award, 2015. The Alchemy of Soil Exhibition continues daily 1 – 5pm until 21st June at Dunbar Town House Gallery, The High Street, Dunbar. Natalie Taylor will deliver an artist talk on her experience as the John Muir artist in Residence and her work in the exhibition at 7pm on Wednesday 17th June at Dunbar Town House Gallery. This entry was posted on June 9, 2015 at 8:30 am and is filed under News. You can follow any responses to this entry through the RSS 2.0 feed. You can leave a response, or trackback from your own site.